Harl. MS. 6,148, f. 45 b. B. M. Cranmer's Letters, 289. Marvels a little that he left a note with John Blag, Cranmer's grocer, to preach at Paul's Cross on the third Sunday after Trinity Sunday, when he himself requested that he might be there the first Sunday after Trinity, to which he was accordingly appointed. Desires him therefore not to fail to be at the Cross on the said first Sunday. Asks for an answer for the bearer. Croydon, 6 May. Headed: To one that was appointed to preach at Paul's Cross. 617. The University of Oxford to Cromwell. Learn from his letters his favor to the university, and his desire for concord among them. Are much injured by the unjust complaints of the townsmen. 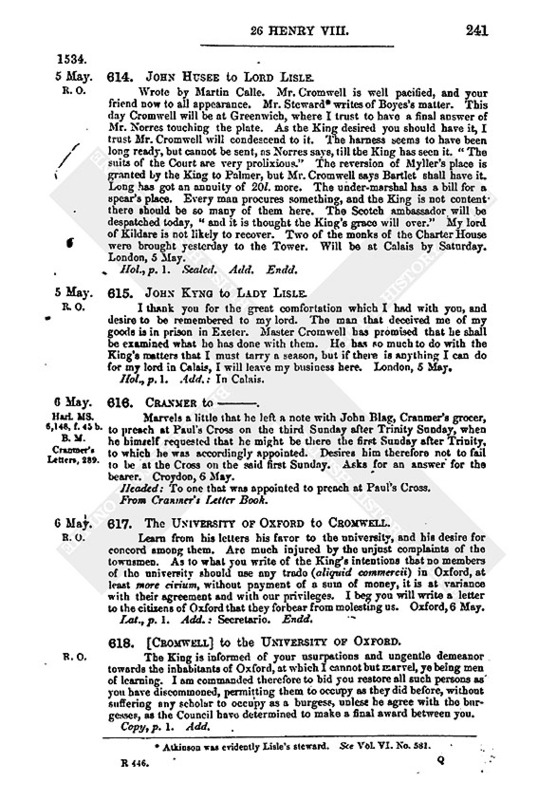 As to what you write of the King's intentions that no members of the university should use any trado (aliquid commercii) in Oxford, at least more civium, without payment of a sum of money, it is at variance with their agreement and with our privileges. I beg you will write a letter to the citizens of Oxford that they forbear from molesting us. Oxford, 6 May. Lat., p. 1. Add. : Secretario. Endd. 618. [Cromwell] to the University of Oxford. The King is informed of your usurpations and ungentle demeanor towards the inhabitants of Oxford, at which I cannot but marvel, ye being men of learning. I am commanded therefore to bid you restore all such persons as you have discommoned, permitting them to occupy as they did before, without suffering any scholar to occupy as a burgess, unless he agree with the burgesses, as the Council have determined to make a final award between you. 1. On the 28 Nov. 25 Hen. VIII.,— (blank), Cowper, clk., who usurps the office of clerk of the market, took from Will. Gybbe's wife a live pykerell 13 inches long as forfeit, which if forfeitable should have belonged to the office of the King's water baily. It was restored by the mayor. 2. On Saturday 29 Nov., Ric. Thorneton, monk, deputy to Will. Tresbam, commissary of the university, came to the market place with an unlawful assembly. The mayor asking what he intended to do, he said he came to make proclamation in the King's name, but he refused to show his authority. The mayor then desired him to do nothing but what the King's laws would sanction, but he said he would take no such commandment from him, and made proclamation at his pleasure. 3. The mayor immediately after ordered the crier to make three Oyezes in the King's name, and when the crier began,—Weston, Hugh Cotton, scholars, and others asked the crier, “Where be the bears that shall be baited?” and so despised the proclamation made for the King. 4. The said deputy on the same 29 Nov. went to the congregation house and enacted that no scholar or scholar's servant should buy or sell or eat or drink with certain persons under a penalty of 6s. 8d., among whom were John Pye, mayor, John Austen, Mich. Hethe, aldermen, and nine others named. 5. Ric. Flaxeney and Will. Tayllor, who brought a letter from master Cromwell to the commissary Will. Tresham, were discommoned after delivering it. 6. On the 13th Dec. last, Will. 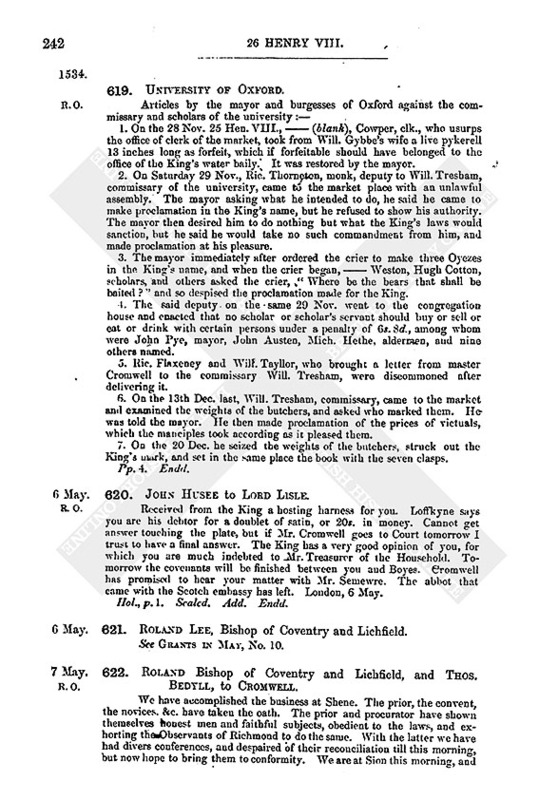 Tresham, commissary, came to the market and examined the weights of the butchers, and asked who marked them. He was told the mayor. He then made proclamation of the prices of victuals, which the manciples took according as it pleased them. 7. On the 20 Dec. he seized the weights of the butchers, struck out the King's mark, and set in the same place the book with the seven clasps. 620. John Husee to Lord Lisle. Received from the King a hosting harness for you. Loffkyne says you are his debtor for a doublet of satin, or 20s. in money. Cannot get answer touching the plate, but if Mr. Cromwell goes to Court tomorrow I trust to have a final answer. The King has a very good opinion of you, for which you are much indebted to Mr. Treasurer of the Household. Tomorrow the covenants will be finished between you and Boyes. Cromwell has promised to hear your matter with Mr. Semewre. The abbot that came with the Scotch embassy has left. London, 6 May. Hol., p. 1. Sealed. Add. Endd. 621. Roland Lee, Bishop of Coventry and Lichfield. See Grants in May, No. 10. 622. Roland Bishop of Coventry and Lichfield, and Thos. Bedyll, to Cromwell. We have accomplished the business at Shene. The prior, the convent, the novices, &c. have taken the oath. The prior and procurator have shown themselves honest men and faithful subjects, obedient to the laws, and exhorting the Observants of Richmond to do the same. With the latter we have had divers conferences, and despaired of their reconciliation till this morning, but now hope to bring them to conformity. We are at Sion this morning, and after we have heard mass shall begin our matters with the abbess and sisters, and with the confessor and his brethren, and we hope of success. Master Mores has been a diligent mediator betwixt the ladies and fathers of the said house and us, and deserves great praise. We are loth to return till we have lost all hope of bringing the matter to effect. Mores cannot wait upon you at the day you appointed, in consequence of his business with the Treasurer. Sion, 7 May. Signed. 623. Abbot of Waltham to [Cranmer]. Harl. MS. 6,148, f. 77. B. M.
Has received his letters, given credence to his servant and performed the same. Asks his favor for Sir John Symkyns, cellarer of “my house of St. Bartylmewes,” to be prior of St. Gregory's Canterbury, the present prior being about to resign. The abbot's friend, master Cressey, can tell more of him. Waltham, 7 May. Headed: By the abbot of Waltham. 624. Harry Huttoft to Cromwell. I thank you for obtaining for me the surveyorship. The matter that of late chanced in the weighing of wools by which the King's custom was defranded, is a great grief to me. I did as faithful and true service as I could, and I hope no lack of diligence will be imputed to me; and I am glad that the crafty dealing in this matter has been detected. 8 May. Your servant has been detained here by an ague. 625. 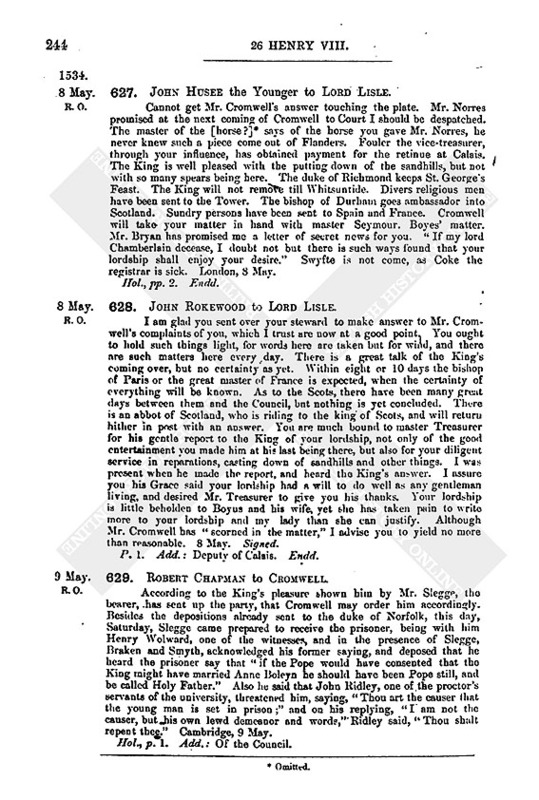 William Symonds to Cromwell. I sent you letters dated the 4th inst. advertising you of a certain mode or commission given to the captain of the galleys by the signory of Venice not to take on board any wools or bastards after the 29 April; also the examination of certain offenders in the weight of wool. I fear they have not yet come to your hands. Since then I have repoised 68 pokes of wool. This day the captain loads 200 or 300 pokes in the galleys and the ship called the Margaret Harte; but for 300 or 400 pokes there will be no shipping. Hampton, 8 May. Hol., p. 1. Add. : Of the Privy Council. 626. The Town of Southampton to Cromwell. We have received your letters by Will. Symons, which are the greatest discomfort to us. The fault attributed to us in weighing wools is, if fairly examined, no fault at all, except it be negligence; but as an honest man was appointed to use it, we thought ourselves discharged. We thought to serve the King for his goodness in granting us the office. But as you state that the beam was not indifferently used, in the sight of Will. Symons and Knyght we examined the matter and found the falsehood thereof to be in the porters, and in oversight of the weighing that the craft of the porters had been overlooked. We have discharged them and committed them to prison, and bound the weigher under sureties to answer his negligence. We hope the office will not be taken from us. It is little more than a year since we had it. Hampton, 8 May. Signed: John Perchard, mayor of Hampton, with the advice of his brethren. Hot., pp. 2. Add. : Of the King's Council. 627. John Husee the Younger to Lord Lisle. Cannot get Mr. Cromwell's answer touching the plate. Mr. Norres promised at the next coming of Cromwell to Court I should be despatched. The master of the [horse?] (fn. 1) says of the horse you gave Mr. Norres, he never knew such a piece come out of Flanders. Fouler the vice-treasurer, through your influence, has obtained payment for the retinue at Calais. The King is well pleased with the putting down of the sandhills, but not with so many spears being here. The duke of Richmond keeps St. George's Feast. The King will not remove till Whitsuntide. Divers religious men have been sent to the Tower. The bishop of Durham goes ambassador into Scotland. Sundry persons have been sent to Spain and France. Cromwell will take your matter in hand with master Seymour. Boyes' matter. Mr. Bryan has promised me a letter of secret news for you. “If my lord Chamberlain decease, I doubt not but there is such ways found that your lordship shall enjoy your desire.” Swyfte is not come, as Coke the registrar is sick. London, 8 May. 628. John Rokewood to Lord Lisle. 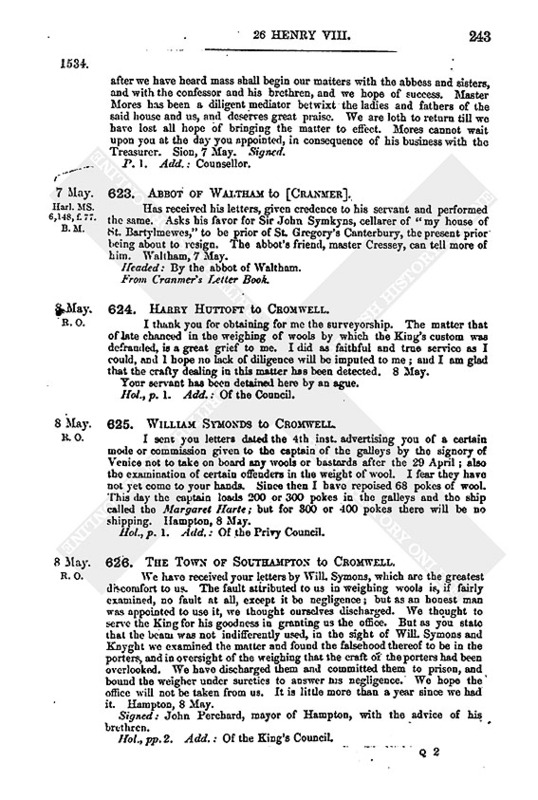 I am glad you sent over your steward to make answer to Mr. Cromwell's complaints of you, which I trust are now at a good point. You ought to hold such things light, for words here are taken but for wind, and there are such matters here every day. There is a great talk of the King's coming over, but no certainty as yet. Within eight or 10 days the bishop of Paris or the great master of France is expected, when the certainty of everything will be known. As to the Scots, there have been many great days between them and the Council, but nothing is yet concluded. There is an abbot of Scotland, who is riding to the king of Scots, and will return hither in post with an answer. You are much bound to master Treasurer for his gentle report to the King of your lordship, not only of the good entertainment you made him at his last being there, but also for your diligent service in reparations, casting down of sandhills and other things. I was present when he made the report, and heard the King's answer. I assure you his Grace said your lordship had a will to do well as any gentleman living, and desired Mr. Treasurer to give you his thanks. Your lordship is little beholden to Boyus and his wife, yet she has taken pain to write more to your lordship and my lady than she can justify. Although Mr. Cromwell has “scorned in the matter,” I advise you to yield no more than reasonable. 8 May. Signed. 629. 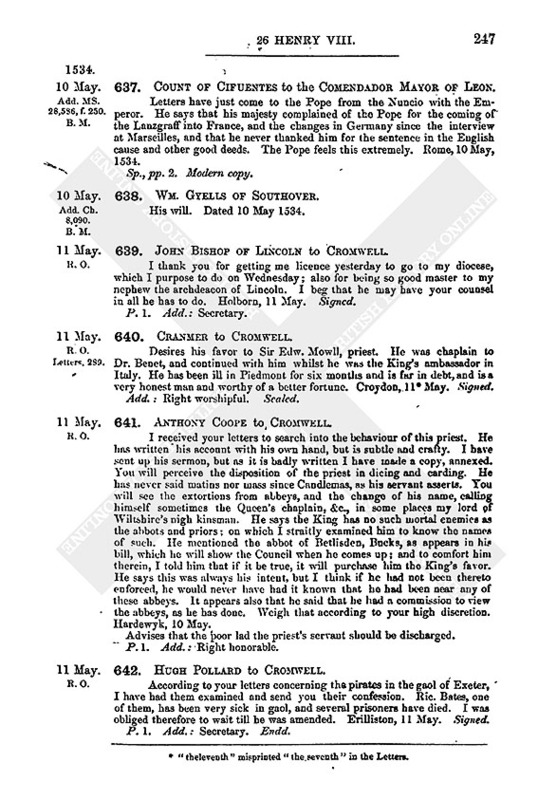 Robert Chapman to Cromwell. According to the King's pleasure shown him by Mr. Slegge, the bearer, has seat up the party, that Cromwell may order him accordingly. 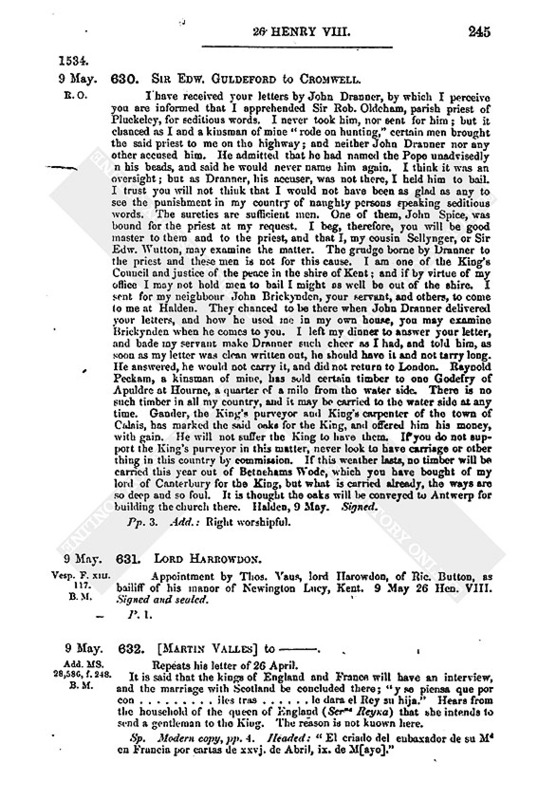 Besides the depositions already sent to the duke of Norfolk, this day, Saturday, Slegge came prepared to receive the prisoner, being with him Henry Wolward, one of the witnesses, and in the presence of Slegge, Braken and Smyth, acknowledged his former saying, and deposed that he heard the prisoner say that “if the Pope would have consented that the King might have married Anne Boleyn he should have been Pope still, and be called Holy Father.” Also he said that John Ridley, one of the proctor's servants of the university, threatened him, saying, “Thou art the causer that the young man is set in prison;” and on his replying, “I am not the causer, but his own lewd demeanor and word,” Ridley said, “Thou shalt repent thee.” Cambridge, 9 May. 630. Sir Edw. Guldeford to Cromwell. I have received your letters by John Dranner, by which I perceive you are informed that I apprehended Sir Rob. Oldeham, parish priest of Pluckeley, for seditious words. I never took him, nor sent for him; but it chanced as I and a kinsman of mine “rode on hunting,” certain men brought the said priest to me on the highway; and neither John Dranner nor any other accused him. He admitted that he had named the Pope unadvisedly in his beads, and said he would never name him again. I think it was an oversight; but as Dranner, his accuser, was not there, I held him to bail. I trust you will not think that I would not have been as glad as any to see the punishment in my country of naughty persons speaking seditious words. The sureties are sufficient men. One of them, John Spice, was bound for the priest at my request. I beg, therefore, you will be good master to them and to the priest, and that I, my cousin Sellynger, or Sir Edw. Wutton, may examine the matter. The grudge borne by Dranner to the priest and these men is not for this cause. I am one of the King's Council and justice of the peace in the shire of Kent; and if by virtue of my office I may not hold men to bail I might as well be out of the shire. I sent for my neighbour John Brickynden, your servant, and others, to come to me at Halden. They chanced to be there when John Dranner delivered your letters, and how he used me in my own house, you may examine Brickynden when he comes to you. I left my dinner to answer your letter, and bade my servant make Dranner such cheer as I had, and told him, as soon as my letter was clean written out, he should have it and not tarry long. He answered, he would not carry it, and did not return to London. Raynold Peckam, a kinsman of mine, has sold certain timber to one Godefry of Apuldre at Hourne, a quarter of a milo from the water side. There is no such timber in all my country, and it may be carried to the water side at any time. Gander, the King's purveyor and King's carpenter of the town of Calais, has marked the said oaks for the King, and offered him his money, with gain. He will not suffer the King to have them. If you do not support the King's purveyor in this matter, never look to have carriage or other thing in this country by commission. If this weather lasts, no timber will be carried this year out of Betnehams Wode, which you have bought of my lord of Canterbury for the King, but what is carried already, the ways are so deep and so foul. It is thought the oaks will be conveyed to Antwerp for building the church there. Halden, 9 May. Signed. Pp. 3. Add. : Right worshipful. Vesp. F. XIII. 117. B. M.
Appointment by Thos. Vaus, lord Harowdon, of Ric. Button, as bailiff of his manor of Newington Lucy, Kent. 9 May 26 Hen. VIII. Signed and sealed. 632. [Martin Valles] to —. Add. MS. 28,586, f. 248. B. M.
Repeats his letter of 26 April. It is said that the kings of England and France will have an interview, and the marriage with Scotland be concluded there; “y se piensa que por con . . . . . iles tras . . . . . le dara el Rey su hija.” Hears from the household of the queen of England (Ser*** Reyka) that she intends to send a gentleman to the King. The reason is not known here. My father was buried last Monday. I beg the continuance of your favor. Scoteney, 10 May. Hol., p. 1. Add. : Secretary. 634. 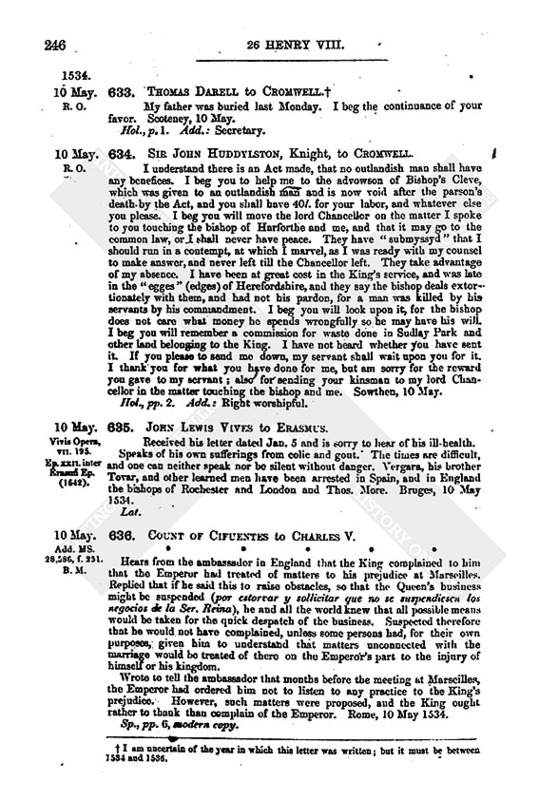 Sir John Huddylston, Knight, to Cromwell. I understand there is an Act made, that no outlandish man shall have any benefices. I beg you to help me to the advowson of Bishop's Cleve, which was given to an outlandish man and is now void after the parson's death by the Act, and you shall have 40l. for your labor, and whatever else you please. I beg you will move the lord Chancellor on the matter I spoke to you touching the bishop of Harforthe and me, and that it may go to the common law, or I shall never have peace. They have “submyssyd” that I should run in a contempt, at which I marvel, as I was ready with my counsel to make answer, and never left till the Chancellor left. They take advantage of my absence. I have been at great cost in the King's service, and was late in the “egges” (edges) of Herefordshire, and they say the bishop deals extortionately with them, and had not his pardon, for a man was killed by his servants by his commandment. I beg you will look upon it, for the bishop does not care what money he spends wrongfully so he may have his will. I beg you will remember a commission for waste done in Sudlay Park and other land belonging to the King. I have not heard whether you have sent it. If you please to send me down, my servant shall wait upon you for it. I thank you for what you have done for me, but am sorry for the reward you gave to my servant; also for sending your kinsman to my lord Chancellor in the matter touching the bishop and me. Sowthen, 10 May. Hol., pp. 2. Add. : Right worshipful. 635. John Lewis Vives to Erasmus. Vivis Opera, VII. 195. Ep. XXII. inter Erasm Ep. (1642). Received his letter dated Jan. 5 and is sorry to hear of his ill-health. Speaks of his own sufferings from colic and gout. The times are difficult, and one can neither speak nor be silent without danger. Vergara, his brother Tovar, and other learned men have been arrested in Spain, and in England the bishops of Rochester and London and Thos. More. Bruges, 10 May 1534. 636. Count of Cifuentes to Charles V.
Add. MS. 28,586, f. 251. B. M.
* * * * *Hears from the ambassador in England that the King complained to him that the Emperor had treated of matters to his prejudice at Marseilles. Replied that if he said this to raise obstacles, so that the Queen's business might be suspended (por estorvar y sollicitar que no se suspendiesen los negocios de la Ser. Reina), he and all the world knew that all possible means would be taken for the quick despatch of the business. Suspected therefore that he would not have complained, unless some persons had, for their own purposes, given him to understand that matters unconnected with the marriage would be treated of there on the Emperor's part to the injury of himself or his kingdom. Wrote to tell the ambassador that months before the meeting at Marseilles, the Emperor had ordered him not to listen to any practice to the King's prejudice. However, such matters were proposed, and the King ought rather to thank than complain of the Emperor. Rome, 10 May 1534. Sp., pp. 6, modern copy. 637. Count of Cifuentes to the Comendador Mayor of Leon. Add. MS. 28,586, f. 250. B. M.
Letters have just come to the Pope from the Nuncio with the Emperor. He says that his majesty complained of the Pope for the coming of the Lanzgraff into France, and the changes in Germany since the interview at Marseilles, and that he never thanked him for the sentence in the English cause and other good deeds. The Pope feels this extremely. Rome, 10 May, 1534. 638. Wm. Gyells of Southover. Add. Ch. 8,090. B. M.
His will. Dated 10 May 1534. 2. I am uncertain of the year in which this letter was written; but it must be between 1534 and 1536.